David Kwong has a trick that’s all his own. David Kwong shuffles the cards. Behind him, a video gives a closer look at his hands. Kwong demonstrates his newest trick, using Scrabble tiles, a timer, and a dollar bill. 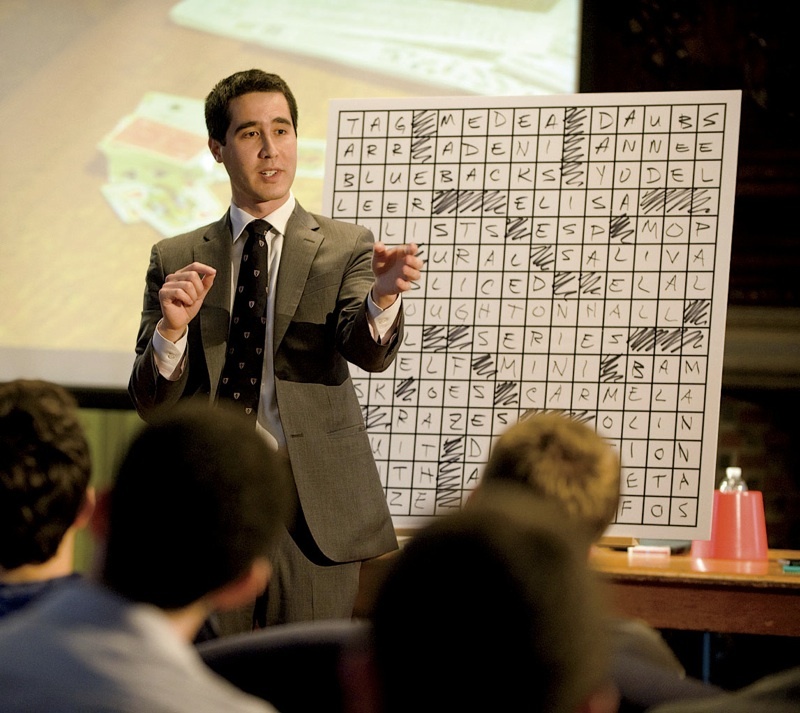 With audience input, Kwong constructs a crossword puzzle containing a hidden message. Kwong’s interests in crossword puzzles and prestidigitation propelled him into the New York Times for his one-of-a-kind fusion of card trick and word game. He begins by asking an audience member to choose a card from a standard deck and keep it hidden from him. Then, standing in front of an easel holding a large blank grid of crossword squares, he asks the room for a word suggestion and fills the center of the grid with those letters to start things off. (“It all ripples outward from the middle,” he says of these performance-piece puzzles.) 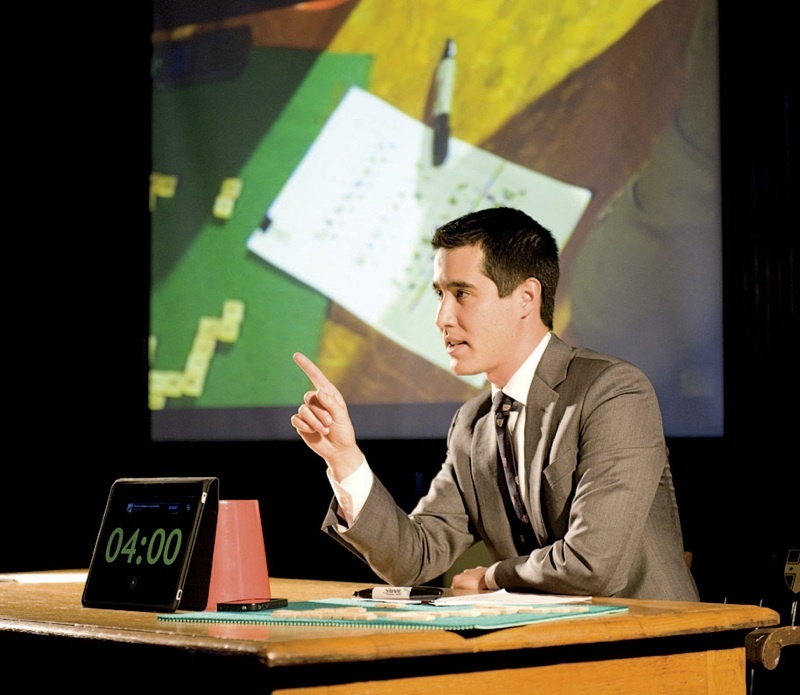 Next he tosses verbal clues to the crowd, seeking words common in Times crosswords. Public participation is crucial in Kwong’s act. “A successful and engaging performance comes from performing for a sophisticated and savvy audience,” he notes. “The smarter the audience, the more fun it is, I think. I can start to stump them and give them more interesting clues.” As people solve his challenges, he fills the grid with their answers, riffing cleverly off the audience responses as he goes along and occasionally blocking out black squares in classic crossword style. When he’s completed the collaborative puzzle, he reveals the identity of the hidden card—miraculously embedded within the newly made crossword. Although Kwong’s beginnings in magic stem from simple sleight-of-hand tricks he learned as a kid from books and a magic set he received as a gift, the evolution of his conjuring skills to include crossword construction is a career milestone. “In the 25 years I’ve been a magician, I’ve never before invented my own brand-new trick,” he admits. Though a long-time magic aficionado, he didn’t become interested in professional magic until freshman year, when he attended a performance by Ricky Jay, who “gave an absolutely scintillating talk” on the history of magic. Kwong later wrote his history honors thesis on Oriental magicians and their impersonators: “I was captivated by stories of these magicians at the turn of the twentieth century, what’s commonly known as the Golden Age of Magic.” His love for magic extended outside the classroom as well. At one Arts First celebration, he reports, he performed Houdini’s “Metamorphosis” illusion before then Harvard president Larry Summers and taught Summers how to produce a bouquet of flowers from his sleeve. 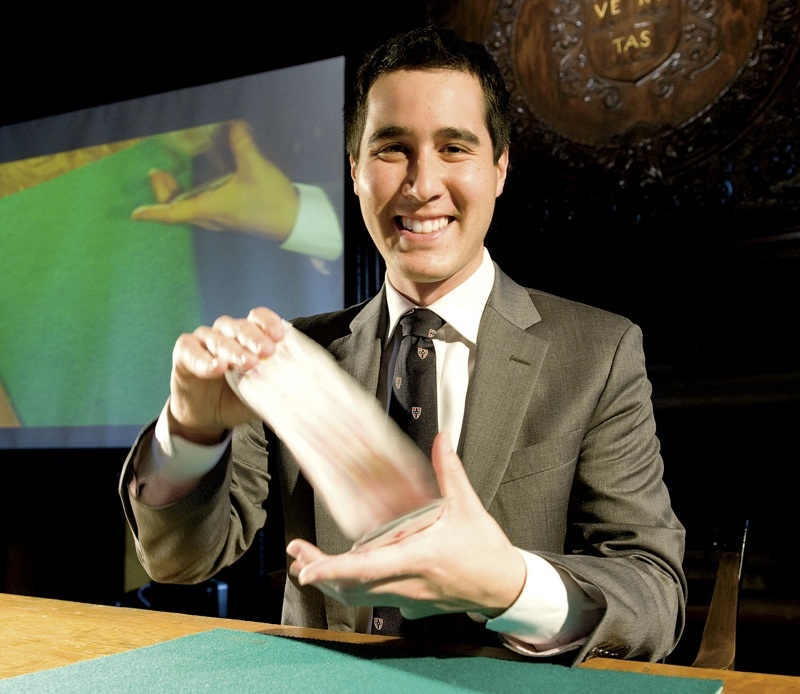 After graduation, Kwong lived in Hong Kong for two years, hiring himself out as a magician for cocktail hours at events for banks and law firms (a practice he continues stateside: “There are hundreds of magicians who make a fine living doing corporate entertainment,” he says). Then he did a stint in marketing at HBO in New York before becoming an archivist for Ricky Jay in Los Angeles. Now Kwong works in development at DreamWorks Animation, where he has helped create hits like Kung Fu Panda. His own movie consulting company, Misdirectors Guild, advises producers on magic in filmmaking. “For All About Steve [starring Sandra Bullock as a quirky cruciverbalist], I taught Sandra how to construct a puzzle for the opening sequence,” he recounts. “She was extremely bright!” He has consulted with screenwriter Noah Oppenheim ’00 on the upcoming biopic The Secret Life of Houdini, and worked on the script of Now You See Me—a film about magicians who rob banks using their skills of illusion—which just began production. And in early October, he returned to Harvard to give a magic show at Kirkland House in conjunction with the history department—a concentrator who’s made good in an unusual way.